Engineers at the Cockrell School of Engineering at The University of Texas at Austin have developed a new type of battery cell that could one day result in faster-charging, longer-lasting and safer batteries for use in a variety of devices. 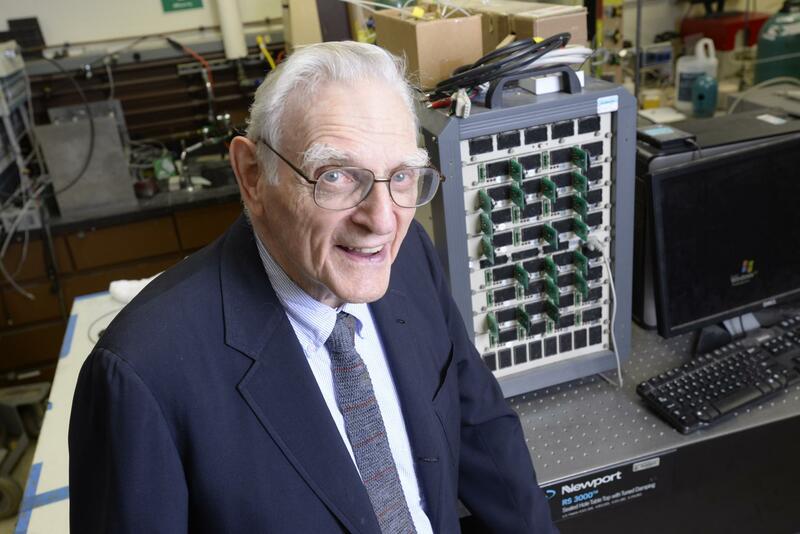 Led by John Goodenough, the 94-year-old professor and co-inventor of the lithium-ion battery, the team has developed the first all-solid-state battery which is non-combustible, has a long life cycle and is inexpensive to manufacture. As UT News highlights, the scientists demonstrated that their new battery cells have at least three times the energy density of modern lithium-ion batteries. This means, for example, that batteries used in an electric car would result in a higher driving range (more miles between charges). Unlike traditional lithium-ion batteries that use liquid electrolytes to transport lithium ions between the anode and cathode, this new battery design relies on glass electrolytes which allows for the use of an alkali-metal anode that doesn’t form dangerous dendrites. The team is working to further advance their battery technology and have several patents in the works. The ultimate goal is to work with battery makers to develop and test their technique in electric vehicles and energy storage devices like those from Tesla. While it’s easy to get excited about the prospect of new battery technology, one must remember that this is a song we’ve heard time and again. Advancements in this space are often spoke of but getting a product to market with any sort of meaningful impact has proven elusive in recent memory.